"Veganism is a way of living that seeks to exclude, as far as possible and practicable, all forms of exploitation of, and cruelty to, animals for food, clothing and any other purpose." In-game veganism is simply a playstyle that I prefer, in that I think survival games offer a unique way to explore vegan ethics that the real world doesn't provide. For example, attempting to adhere to veganism within Minecraft leads to weird/interesting questions like, "Is it really self-defense to kill a mob if I'm semi-responsible for mobs being able to spawn at all?". It can also encourage non-standard behavior like building a weapon that does the least amount of damage possible. Do I have to play as a vegan if I install this? Should I go vegan (in real life)? Man even if you aren't a vegan (I'm not bit I'm working on becoming one) you should still check this out a lot of useful stuff . Squeek, you might want to update this page to link to a new 1.12.2 fork that has shown up. I would love to see this mod updated to 1.12.2 any time soon. Is the download counter correct?! Cant believe it is, since this was a basic mod in "Life in the Woods" since its release which should've gained this mod a massive boost in popularity. I loved your ways of crafting things differently from the normal, "carnivorous" ways in vanilla mc and used it all the time in 1.7.10. 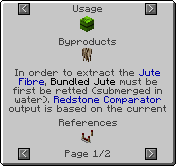 Best example: Large Fern -> Jute -> Bundled Jute -> Jute Fibre -> Burlap = leather alternative! Unfortunately, I've become less involved in Minecraft modding, and the port to 1.12 would require considerable effort due to the changes with how Minecraft/Forge handles recipes (since a lot of VO's functionality deals with transforming recipes and whatnot). Unless someone else takes the reigns, an update isn't too likely at this point. P.S. IIRC Life in the Woods used its own launcher/downloader to distribute its files so I don't think those downloads counted towards the download count on Curseforge. Someone actually made a 1.12.2 fork. Im not vegan, but cool! I'm currently developing a mod called "Veganism" and I had no idea you guys were doing this as well. Hope you don't mind, but if you do just dm me and I'm sure we can figure something out! Cool, no worries at all. 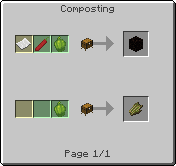 Note that it's currently unclear whether or not The Vegan Option will be updated to 1.12+, as it will require some pretty major rewrites due to the recipe changes and I'm not very active with modding anymore. 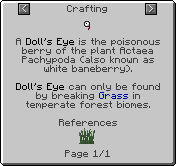 Note also that The Vegan Option is released under an extremely permissive license, so you're welcome to incorporate any parts of this mod into your own if you'd like (code, ideas, whatever). Do you mind if I look through your git? I've got a little bit of experience with the new recipe system so I might be able to fork and help out a little! but nvm. Thanks for creating this mod! In case you didn't see it, the 1.10.2 version is now available. 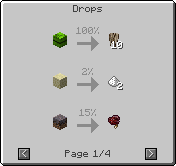 I like the idea, and may include this mod in my pack with some recipe tweaks. My big concern is balance. A number of items such as Ender Pearls and Ghast Tears are used for powerful items in many mods because they are hard to locate, dangerous to acquire, and may not even drop every time. The problem I see is that the current methods seem both safer and more reliable than the regular way of getting the ingredient. If I give the player an option to use a shovel to quickly harvest a desert of soul sand rather than fighting a ghast . . . why would they bother trekking all over a dangerous dimension in search of a fire breathing monster? This goes extra if the drops are similar to flint where you used to be able to place the block down and get another chance at it repeatedly. Similarly . . . I find farming endermen in the end to be cheap . . . you put down a two high platform, stand under it, and aggro them in perfect safety . . . but in vanilla play you at least have to defeat a powerful dragon before you can exploit that. Perhaps fragments of suffering could poison you and cause nausea at set intervals when held in your inventory. If they also ONLY dropped in the nether dimension it would make for an interesting play balance. Do you try to rush them out while losing health and being a bit dizzy? Or do you get rid of them ASAP and look for the nearest Ghast? Similarly goo pouring out of the end through a rift might be unstable and prone to teleport nearby players and passive mobs randomly in the same (large) range that an enderman can teleport. Now you have a decision to make, do you risk having yourself (or your livestock) teleported into a potentially dangerous situation each time you craft a pearl, or do you look for a way to the end? Any 1.10 release version coming soon? Or an alpha build? Working on a peaceful pack and thought of this mod.